We all know that trash and plastic are two huge global issues. In Bali, they are an even bigger problem. Unlike in our Western countries, waste management isn’t properly handled on the island and with the ever-growing number of yearly visitors, the problem is increasingly urgent. More importantly, trash is often left to the local communities to be taken care of. The Balinese nature suffers from over-use of plastics, and locals - often poorly educated villagers (farmers and fishermen) - are not aware of the disastrous consequences of burning plastics and/or throwing away inorganic garbage carelessly into rivers or the ocean. Trash Hero is an officially registered NGO based in Switzerland, which was founded in Thailand in 2013 by a group of friends; they were appalled by the amount of trash that had landed on the Koh Lipe (located in a National Marine Park) after the tsunami had hit the coast. Instead of whining and complaining about how dirty the beaches were, they took action and gathered 17 people to help cleanup an entire small island. That was Trash Hero’s first cleanup ever. Two years later, Trash Hero arrived in Amed and from the very start, partnered up with a locally present and active NGO Peduli Alam, meaning "Protect Nature" in Indonesian. Peduli Alam was created in 2008 by a dynamic French young woman who fell in love with the area and specializes in waste management and collection in Amed. Among its many activities, the Peduli Alam organizes awareness campaigns in surrounding schools and villages related to waste management. Since May 2015, Trash Hero and Peduli Alam have been collaborating amazingly well. Each and every Monday at 5pm – no matter what – they organize a weekly beach cleanup. From week to week, they move from beach to beach, covering the entire area from Melasti beach till the small village of Aas. Everyone is welcome: the Balinese people, the expat community, business owners, and tourists ad travellers just like you, who travel to our beautiful area of Amed. The most beautiful part of all this: they are all volunteering! Does it work? The numbers speak for themselves: at the time of writing this (August 2016), over 2000+ Trash Heroes have collectively picked up over 11 ton of trash from the beaches around Amed. The trash is sorted by Peduli Alam into two parts: Peduli Alam keeps “clean” trash that they recycle (see below) and the rest goes to the sorting station in the nearby town of Amlapura. We are very lucky and proud to have our very own Marketing Manager, Valerie Derbaudrenghien, greatly involved with Trash Hero Amed, as she is part of their leading team. Valerie volunteers her free time to Trash Hero and is an active member of a slow but determined “eco revolution” here in Amed. As our guest, you are kindly invited to join Trash Hero’s weekly cleanups and help out. There is no sign up and no cost. Just show up. You’ll be given an empty garbage bag, a pair of gloves, and off you go collecting any inorganic trash you can find on the beach, along with many other Trash Heroes. The weekly cleanups are a fun and great way to contribute to the local community by giving an hour or two of your time! Drinking water is provided by local businesses for all the Volunteers. 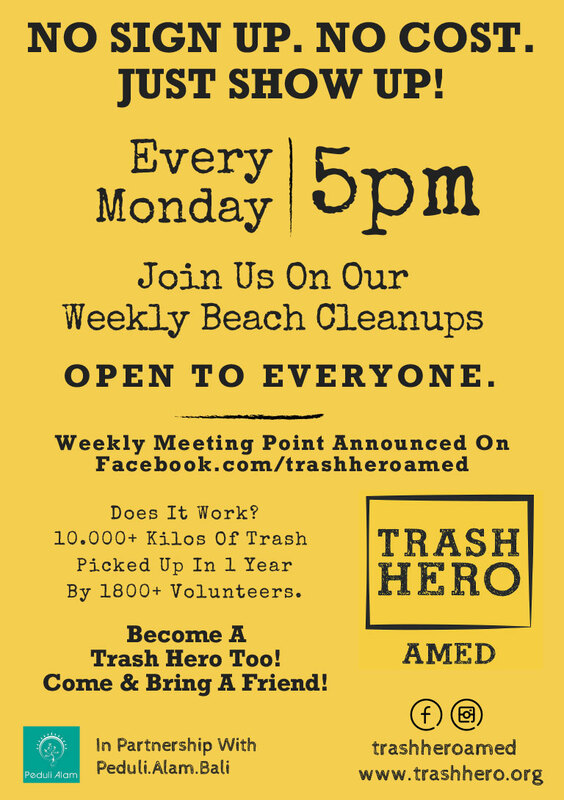 The exact meeting place is announced each week on Trash Hero Amed on Facebook. You can also talk directly with Valerie of course, who will happily fill you in on any details. In summary: Every Monday at 5pm till 6.30pm on a different beach around Amed. Read more about Trash Hero’s Mission here: www.trashhero.org/our-mission. If you can’t join our cleanups in Amed, know that Trash Hero is also active in Canggu, Candidasa, Sanur, Ubud, Gili Meno and in Komodo. Each chapter has its own Facebook page. One of Peduli Alam’s many missions is to educate the local community about the “value” of trash. With all the inorganic trash collected in Amed, Peduli Alam organizes recycling workshops. Their purpose is to show and also experiment on everything that can be done with trash that’s been found on the beach. You are invited to join one of Peduli Alam’s workshops to sit down and co-create with fellow travelers, locals and expats. Someone from Peduli Alam will show you what’s already been done (so you can be inspired), but you are also very welcome to bring your own ideas and imagination to the table (or floor) and get your collective creativity juices flowing! The Griya Boutique proudly features bags made with recycled plastic found on Amed’s beaches to support Peduli Alam’s green mission. Feel free to come and have a look, you’ll be blown away by what can be done with reused plastic!